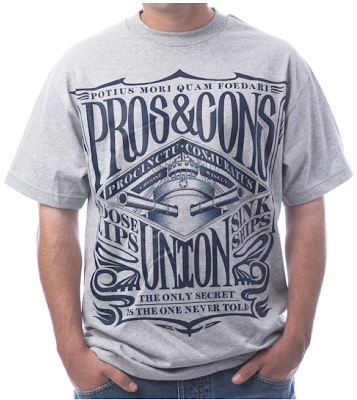 While doing my usual surf on the interweb I came across this LA based brand Pros & Cons Again I like the simple aesthetic, and straight forward styling of the graphics. I think what attracts me most to a brand is the intention behind it. If someone is just out to make a buck it shows. And when someone really puts their heart into it a brand, it shows, and I respect it all the more. This tee has that old time WWII propaganda poster vibe. Dig it!